Yes, the May 1941 MGM Report photo clearly shows “New Century Building” spelled out on the facade above the second-floor windows. The Strand entrance and marquee were located at the right side of the building front. I took a further look at the property. In 1902, the Woman’s Club House was on the site. It looks to have been a headquarters for different Boston women’s clubs. In 1917, the building is called the New Century Building, and houses on one side the Huntington ave Theater, and by 1938 it’s the Strand Ballroom Bldg and the Strand Theater. Here’s a 1938 map showing the Strand – and the Strand Ballroom. I included part of the CS church to help locate the theater. When the 1921 edition of the Boston Register, Issue 85, was published, this theater’s name had changed to “Strand”. The Strand is listed as the “Huntington Avenue Theatre” at 175 Huntington Avenue in the street directory of the 1918 edition of the Boston Register and Business Directory, Issue 83. Mechanics Hall was just to the east at # 111. It was a major convention center in Boston right into the 1950s. I attended the Strand many times in the 1950’s and early 1960’s. The auditorium was fairly ornate but the lobby areas were modest with low ceilings. At that time the theatre was not maintained very well, in stark contrast to the gorgeous Lowe’s State and Uptown and even the Fenway. It seemed to be about half the size of the Uptown, which had an enormous and seldom used balcony. Children were admitted for a dime, reduced from twelve cents in the early 50’s, but had, if not accompanied by an adult, to sit in the left corner of the balcony under the watchful eye of an usher. However, we could always move to the orchestra after going downstairs to buy something from the concession stand or to go to the bathroom. The last time I attended the Strand may have been for a double feature of Ben-Hur and Spartacus, perhaps in 1961; this was affordable entertainment, at less than two cents an hour! The MGM Theatre Photograph and Report form for the Strand on Huntington Avenue has an exterior photo taken in May 1941. The theatre had both a marquee and a vertical sign. On the front of the marquee, underneath the name, are 3 lines of dark letters on a white background reading: Double Feature Program / Selected Short Subjects/ “Goodwill Award” – Thurs. Nites . There are 2 large vertical poster cases right out on the sidewalk, near the curb, and these appear to be supporting the outer edge of the marquee. To the right of the Strand’s entrance, in the next building, is the Strand Fruit Co. store. The Report states that the Strand has been playing MGM product for over 10 years; that it was built around 1900 (incorrect); that it’s in Fair condition; that it’s a “Nabe” (Neighborhood house); and has 513 seats on the main floor and 425 balcony seats, total: 938 seats. Here’s another map of the area from 1917. WardMaps.com is a great map resource and they have many years of Boston real estate maps. They also run a free online forum. If you post a request to see an address they’ll post full res details of that address from all the years in their collection! Pretty cool. You can just barely make out the Strand Theatre on this 1928 map if you know where to look. It is on the left side of Huntington Avenue, about 2/3 of a block below W. Newton Street, just below the ‘NEW CENTURY BLDG’. Unfortunately the “Community Heritage Maps” watermark is partially overlaid on it. It looks quite small, especially compared to the St. James a block and a half further down the avenue. I saw movies there both before and after the name change from Strand to Capri. It was about halfway between the BPL and Symphony Hall, on the same side of Huntington Ave. You went in from the street and then turned left into the rear of the auditorium. It had a balcony, and no more than 800 or 900 seats, certainly not 1800. The 1968 demo year is probably correct, but I’m not sure when it closed prior to that year. The nearby Uptown, a beautiful house, was also razed about 1968. 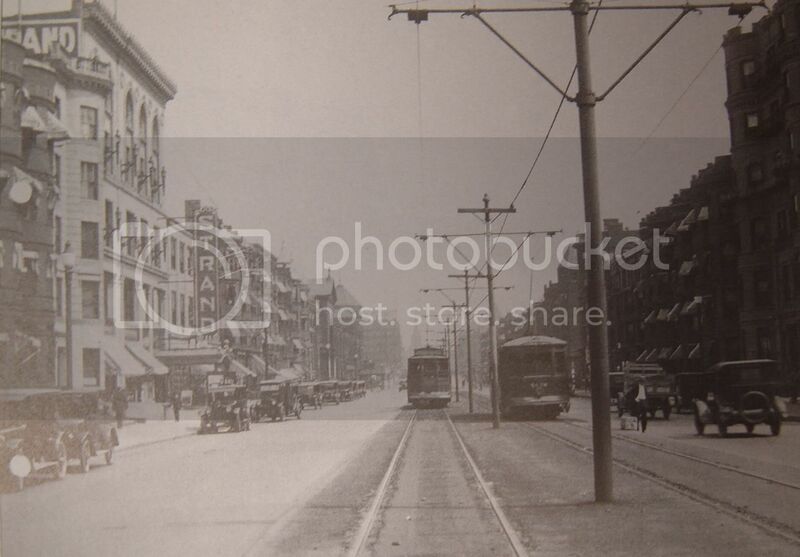 Here is a 1926 photo of Huntington Avenue with the Strand Theatre evident. According to Donald C. King’s new book The Theatres of Boston: A Stage and Screen History, the Huntington Avenue Theatre opened on September 23, 1912, inside the existing Century Building, with 1800 seats. It may have been a remodeling of an earlier dime movie and vaudeville theatre called Potter Hall. It later changed its name to the Strand, but King doesn’t say when that happened. By 1947, it was one of E.M. Loew’s houses. Ben Sack remodeled it and renamed it the Capri on July 6, 1962. It replaced Sack’s first Capri Theatre which was torn down to make way for the Massachusetts Turnpike extension. King says that this theatre was torn down around 1968, but I think Sack had already closed it by 1965 or 66. 175 Huntington Avenue, formerly the address of this theatre, is now the address of the Christian Science Church Administration Building, a 28-story tower. Here’s a photo of it; here’s another one. At the far end of the reflecting pool in both photos is a low building with a semi-circular faÃ§ade. This is the church’s Sunday School building, which replaced the Uptown Theatre. The Bostonian Society Library has this photo of Huntington Avenue, looking northeast, with the Prudential Tower under construction in the background. Near the right side of the photo, a sign on the side of a building says “SACK’S CAPRI”. Below it and further to the right, you can barely make out a theatre marquee. Given the location, this must be the second Capri (formerly Strand), not the first Capri (formerly Copley). The accompanying description says that the marquee advertises Greta Garbo in Anna Karenina, but you certainly can’t see this from the online version of the photo. The description dates the photo to “ca. 1960”. 175 Huntington Avenue is now the official address of the First Church of Christ, Scientist. I did not find the “Strand” in earlier 1960s Boston Globe movie listings and ads, when the Sack Capri was still in Copley Square. When did the Strand last operate under that name? An ad on the Boston Globe movie page in January 1965 gives the Capri’s address as 175 Huntington Avenue, not 115-81. Perhaps the address changed at the same time the name and ownership did. A Boston Globe article from August 29, 1991, says that E.M. Loew was the last operator of the Capri, and that he sold it to the Christian Science Church (not the Prudential Center) for the construction and expansion of their complex. I think Christian Science expansion also cost us several other nearby theaters on Mass. Ave. — the Uptown, the Loew’s State, the Fine Arts. The Strand/Capri was a popular place under Sack when I used to go there in the 1960s. That’s where I first saw ZORBA THE GREEK. I had only been to the Copley Square/Capri once, as a teenage film buff in July of 1959, for a revival of Chaplin’s MODERN TIMES. The Copley Square/Capri should be added as a new theatre to supplement the historical record. around 1965, the second SACK THEATRES HOUSE to have that name. The first CAPRI was when BEN SACK took over the old Copley SQ. Theatre in the late 50’s and used it for a moveover roadshow house from the SAXON on Tremont St. The Mass. Pike extension demolished the First CAPRI. The PRU CENTER finished off the Strand/2nd Capri.